Phil Chenier has been providing color analysis for broadcasts of the Washington Wizards (nee Bullets) of the National Basketball Association (NBA) for the past 25 years. That is a long time to be with one team these days. In honor of his accomplishment, Comcast Sportsnet Mid-Atlantic will be presenting "Phil Chenier Night" at the Friday, April 2, 2010 game between the Chicago Bulls and the Washington Wizards (Verizon Center, Washington, D.C.. 7:00 PM ET). 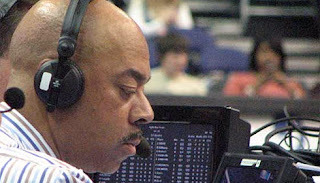 25 Years and Counting: Former Washington Bullets' Star Phil Chenier, shown here from 2007, has covered the Bullets/Wizards as the color analyst for 25 years now. Photo courtesy of Herb Terry. BETHESDA, MD (March 25, 2010) – Comcast SportsNet Mid-Atlantic will recognize Phil Chenier's 25 years as the network's color analyst for the Washington Wizards by hosting "Phil Chenier Night" on April 2 as the Wizards host the Chicago Bulls at Verizon Center at 7 p.m.
Comcast SportsNet will dedicate their live coverage of the game to celebrating Chenier's broadcasting career and host a pregame ceremony recognizing the milestone. As part of the event, many of Chenier's family members, friends, coworkers and former teammates will be in attendance, including Basketball Hall-of-Famers Earl Monroe and Wes Unseld, fellow Bullets teammate Bobby Dandridge and former broadcasting partner Mel Proctor. "Phil is a tremendous analyst, as well as a great person, whose dedication and professionalism over 25 years with our network has made him an icon in both broadcasting and sports," said Comcast SportsNet Senior Vice President and General Manager Rebecca Schulte. "We are proud that he is a member of our network and we are honored to recognize him for reaching this remarkable milestone." "On behalf of the entire Wizards' organization, we congratulate Phil Chenier on 25 outstanding years as our television analyst," said Wizards Executive Vice President Matt Williams. "Our fans benefit from Phil's knowledgeable, in-depth analysis for every game, and the Wizards organization is proud that Phil has represented us with class, distinction and professionalism throughout his career behind the microphone and in uniform." To begin the event, Comcast SportsNet and the Wizards will hold a special pregame ceremony at center court, in which they will air a commemorative video and present him with gifts from both organizations. The presentation, which will air live on Comcast SportsNet, will feature representatives from both organizations, along with his family and special guests. Steve Buckhantz, Comcast SportsNet's Wizards play-by-play announcer, will serve as the ceremony's emcee. Comcast SportsNet will air several elements surrounding the specially-branded game to highlight Chenier's broadcasting career and honor his achievement. These pieces will include interviews, congratulatory messages and features starring people from throughout the broadcasting and sports industries. Several guests are also expected to join Chenier and Buckhantz courtside during the action for in-game interviews and commentary. Following his 10-year NBA playing career, which included nine seasons with the Wizards organization, Chenier began his broadcasting career for what was then Home Team Sports. Serving as color analyst, Chenier called his first game on television in 1984 and has served in that role since. Comcast SportsNet Mid-Atlantic – the official television partner of the Washington Redskins, Washington Capitals, Washington Wizards, D.C. United, Atlantic Coast Conference and Colonial Athletic Association – delivers more than 500 live sporting events per year, along with Emmy Award-winning news, analysis and entertainment programming, to more than 4.6 million homes throughout the District of Columbia, Maryland and Virginia. Comcast SportsNet's digital portfolio, highlighted by CSNwashington.com, is the region's leading source for online sports news and information. Comcast Sports Group operates 10 sports networks that deliver 2,400 sporting events annually and sports news and analysis to more than 50 million cable and satellite homes. Comcast Sports Group's networks are: Comcast SportsNet Bay Area, Comcast SportsNet California, Comcast SportsNet Chicago, Comcast SportsNet Mid-Atlantic, Comcast SportsNet New England, Comcast SportsNet Northwest, Comcast SportsNet Philadelphia, SNY, The Mtn. – Mountain West Sports Network, and CSS. Comcast Sports Group also manages New England Cable News (NECN), the nation's largest regional news network, and The Comcast Network, based in Philadelphia and Washington, which delivers community-oriented programming. For more information, see ComcastSportsNet.com.